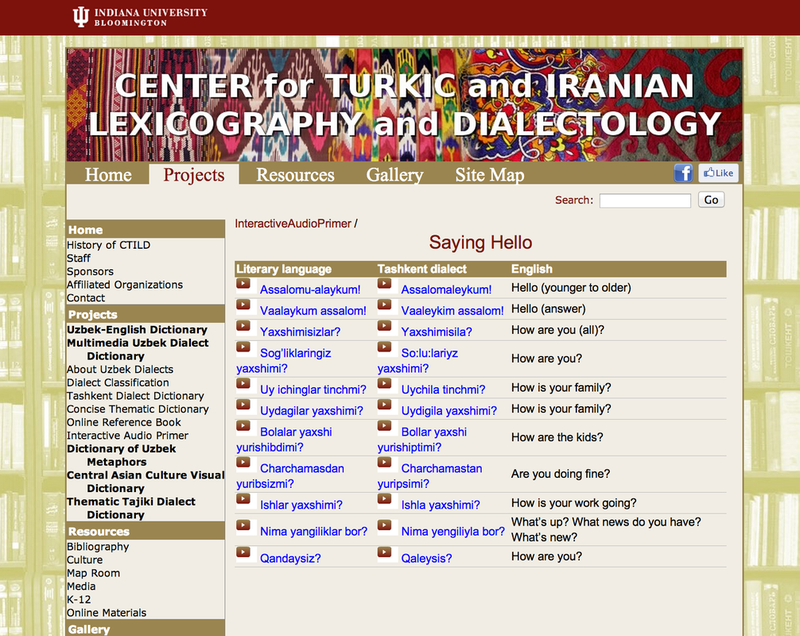 During 2004-2012 I worked at the Center for Turkic and Iranian Lexicography and Dialectology (CTILD) at Indiana University. In collaboration with the team of translators, researchers, lexicographers, and IT specialists, we received two Title VI grants and worked on a number of dictionary projects. The Title VI Uzbek Dictionary Project (2004-2008) developed an online bilingual dictionary of modern literary Uzbek for English speakers. This bilingual dictionary contains over 40,000 Uzbek-English entries (with over 50,000 glosses). My role in this project: Working with Indiana Dictionary Database (IDD), collecting new lexical items and expressions from the web, newspapers, and other recent publications in order to update and expand the dictionary database, as well as including new information on grammatical usage and adding illustrative examples. Focus of the project: Developing scaffolding materials, collecting materials, database development, and website management. The Title VI Web-based Multimedia Uzbek Dialect Dictionary Project (2008-2012) incorporates data from the Title VI Uzbek Dictionary Project and builds on the latter project’s work by creating an online multimedia comparative dictionary that can be used as a self-learning tool by students to listen to, compare, and study the linguistic variation of Uzbek dialects and the literary language. 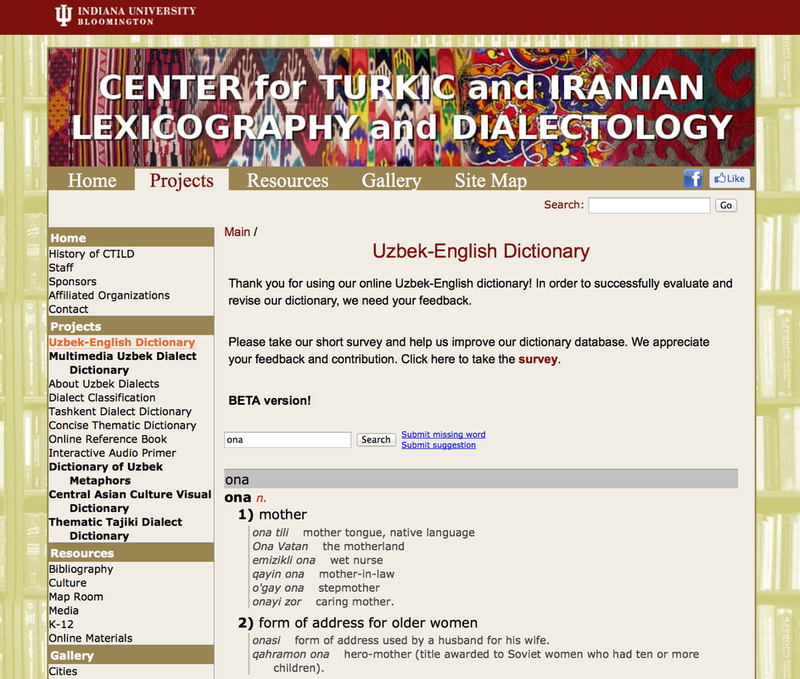 My role in this project: Project coordination, data visualization, creating textual data and monitoring quality of audio recordings of words, phrases, and expressions collected from the Uzbek literary language and from the Tashkent dialect. Focus of the project: Project coordination, developing scaffolding materials, creating online learning environment, media development, data visualization, and website management. 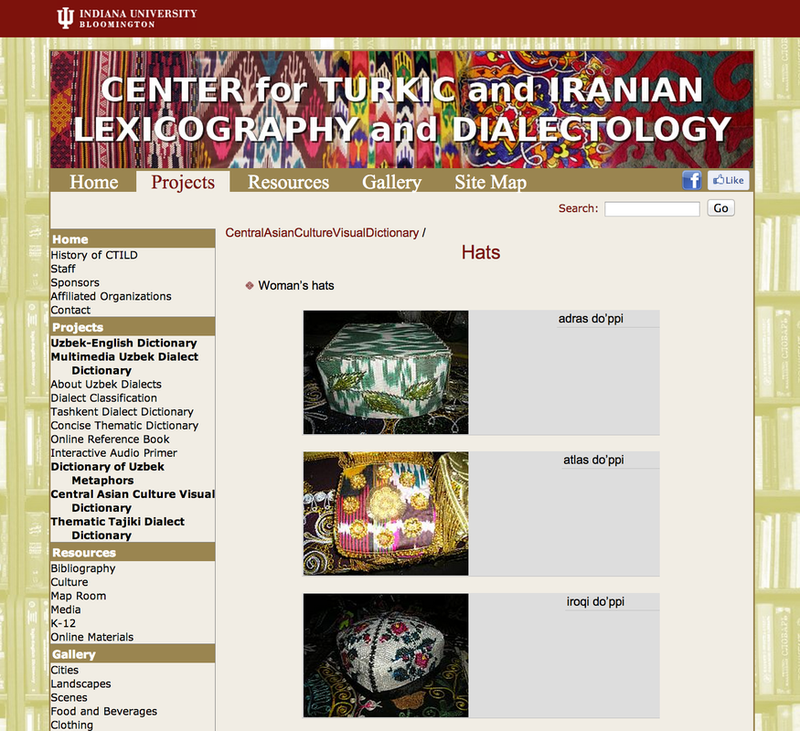 Central Asian Culture Visual Dictionary (2011-2012) is a pilot project and contains a large collection of images of cultural items, many of which are difficult to describe in an English translation. My role in this project: Creating navigation plan, categorizing, editing, embedding, indexing, and tagging images. Focus of the project: Developing scaffolding materials, media development, data visualization, and database and website management.